A dragon is nothing to be trifled with and this rare trap skin proves just that! Celebrate the year of the Dragon or simply show off how awesome dragons are with a blazing barrage of exciting explosions! This brilliant skin takes your always-loyal ACRONYM trap and combines it with buckets of firecrackers. The arcane powers of the trap magically replenish and steer the fireworks with extreme accuracy, firing them out at a rate of 15 firecrackers a second! This trap skin is a MUST for anyone's collection. The Dragonbreath ACRONYM Skin can be used on the Arcane Capturing Rod of Never Yielding Mystery. The trap's stats (power, power bonus, attraction bonus, etc.) are not changed. The Dragonbreath ACRONYM Skin may be made available during the annual Lunar New Year event and can be traded on the Marketplace or through Give To Friends. 23 January 2012: The Dragonbreath ACRONYM Skin was released during the Year of the Dragon Festival. 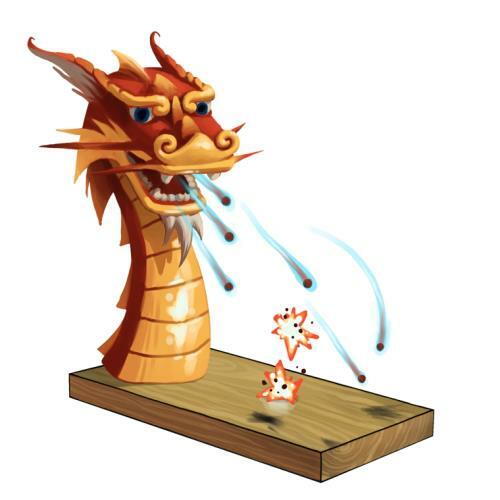 It was available for purchase for 250 Firecracker Charms at the Year of the Dragon Festival Trapsmith, requiring the Dragon Seal. This page was last edited on 9 December 2017, at 11:18.